This is an trend following forex strategy. 3. Wait for a candle to close where conditions 1, 2, and 2 are visible. Place your entry at the next candle's open. 3. Wait for a candle to close where the conditions 1,2, and 3 are visible. When the opposite conditions appear. Profit Target 30-40 depends by currency pairs. Initial stop loss 20 pips, after 20 pips in gain move stop loss at entry level. In the pictures PW Trend forex strategy in action. 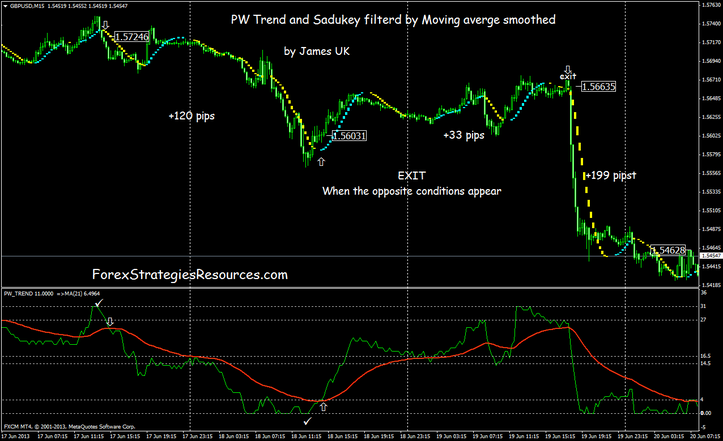 Exit position: the same of the previous PW Trend forex Strategy.